Photo gifts truly are for everyone. It's the ideal present as it crosses age, gender and cultural boundaries. The key to creating the perfect photo gift is really thinking through what your friend, family member or colleague loves then printing that to canvas. It's also a versatile gift suitable for all occasions from birthdays to anniversaries to baby showers and everything in between. Here we present 13 beautiful, memorable photo gift ideas for practical inspiration. Get that giving going now! For the love of sport, get the man (or the boy) something he'll proudly hang in his bedroom, man cave or office. 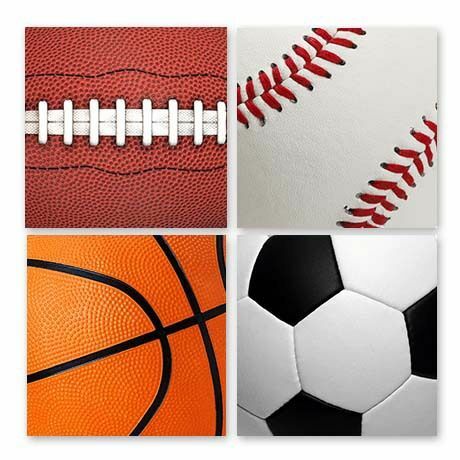 This wall display covers all bases, with football, baseball, basketball and soccer all featured. However, you can include any sports ball you like! Take your own photographs using his own ball collection or find an image online in our Canvas Art collection or on Flickr. If you need an extra hand, contact us and we'll happily source the images for you. Just let us know his favorite sports! This unique gift is a wonderful alternative to actually buying him a new ball, something he's terribly fussy about choosing. Want to see her gush? Then gift her with a stunning glass split image print featuring her one big love. It doesn't have to be a horse (but how beautiful is this horse?). 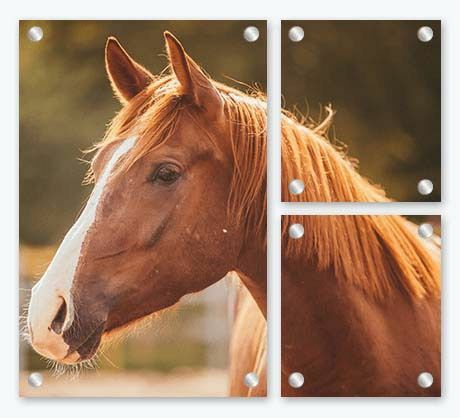 This photo gift idea is less about the horse and more about the hobby. What does she love to do? Travel? Craft? Bushwalking? Surfing? Skating? Horseriding? What does she love? Elephants? Cats? Puppies? Horses? You get the drift. A split image is a wonderful way to transform an otherwise simple photo into a work of art. Mounted on glass takes it to that next level of pretty. Upon receiving this gift, she will gush. No doubt about it. Kids love animals of all shapes and sizes, but if they're not yet ready for a puppy then this birthday present will help fill that gap. 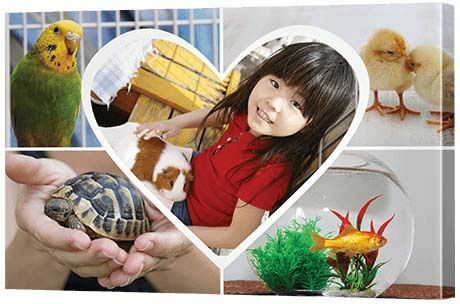 Put your little one front and centre in the heart of this gorgeous modish collage, surrounded by their favorite pets or animals. Or get really creative and surround them with something else they love: farm animals, dinosaurs, dolls, trucks. The key here is that it's personalized, something just for them - a great piece of custom art for their bedroom. Family is the apple of Dad's eye and the one sure thing to make him smile, so this gift is a winner for new and old Dads alike. Bring a smile to Dad's face over and over with a continual reminder of what's important to him - family. Arrange a professional photo shoot or gather together photos of Dad with the kids. 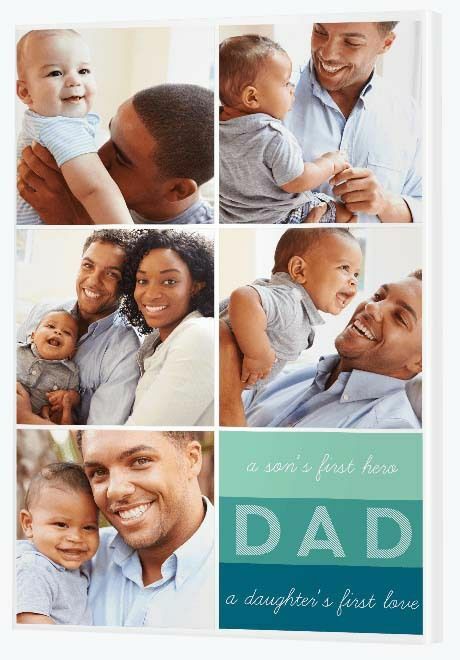 This themed 'Fathers' collage canvas is a perfect way to present the pictures. Alternatively, you might like to choose a Traditional Collage and create your own custom quote using Canva. Canva is a nifty graphic design tool that's very easy to use and means you can choose whatever color, font style and size and quote that you love the most! Once you've created the image, simply upload it along with the rest of your photos into the Canvas Factory CanvasApp. Sound too hard? Well that's why we offer these 'themed' collages. Simply check out the full range. This Father's Day gift is sure to make it to where Dad can enjoy it - either at home or in his office at work. Let the joy and love of Mother's Day live on and on with a photo gift she'll treasure forever more. The pale pink border on this beautiful modish glass collage is a perfect complement to the collection of black and white photos of Mom with baby. Whether the mother in your life is new or one who would love to see her baby as he or she once was, then this Mother's Day gift will surely impress. Perhaps she had a professional photo shoot when the baby was first born and she hasn't yet invested in printing them. Or perhaps it's simply time to gather together all the different photos that were taken when her little one was new to this world and put them up in lights. Either way, black and white means instant art and glass means instant class. If pink's not her favorite of colors, that's fine! You can choose any border color you like. To do this, when creating your glass print, choose your own wrap style. Simply click 'Colored Wrap' then select from the options available, type in your own hex number or use the eye dropper tool to choose a color from the photo to incorporate into the border. When it comes to designing your modish romper collage, the options are endless. Celebrate the best times in your relationship with a wall display of photos from your life together. Metal will last, like your love - so step outside the wonder of canvas for a moment and discover the striking effects of brushed aluminum. Metal has that special upmarket feel so deserving of anniversary milestones. It's not an everyday material for everyday people - and it looks absolutely stunning in a contemporary or modern home. 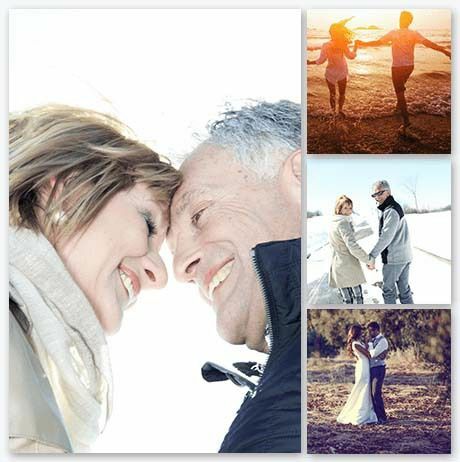 Get together with your spouse to choose the photos or surprise them with your own special selection. And don't feel limited by this layout! There are a number of wall display options available from three to eight frames. If you're always wishing the roses you gift lasted longer than a week then this photo canvas will impress. This breathtaking silhouette heart collage can be transformed into art with ease. Here, we've used the same photo of red roses and placed it on the outer frames to act like a border. Captivating isn't it? The wonderful thing about these templates is you can choose any image you like. If your loved one isn't a fan of roses, you can choose an image more fitting. Whether your proposal is humble or extravagant, the key to looking back with fondness is capturing the moment on camera. You don't have to ruin the surprise element - just hire a photographer or get a friend with a camera to appear after the emotional moment of 'Yes'. Their job is to capture the romance of the moment. Yours is to print that moment on canvas - a gift you can treasure. 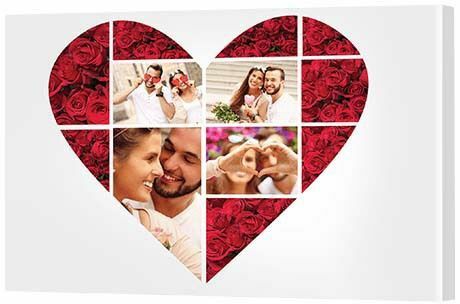 Bring the magic of your wedding day home with a collage canvas you'll love looking back on day in, day out. Many wedding photos are hidden in an album, never to be seen again. But these perfect days feature so much color, fun and charm that they can add brightness to a home's decor. Print the photos on glass and they will shine on for years to come. 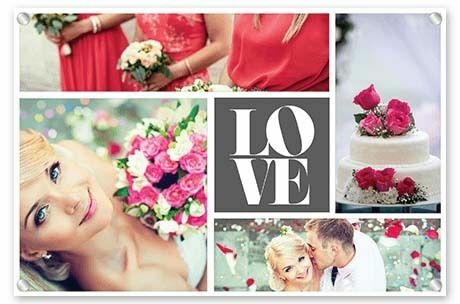 This love themed collage is a wonderful way to present a collection of photos from the big day. 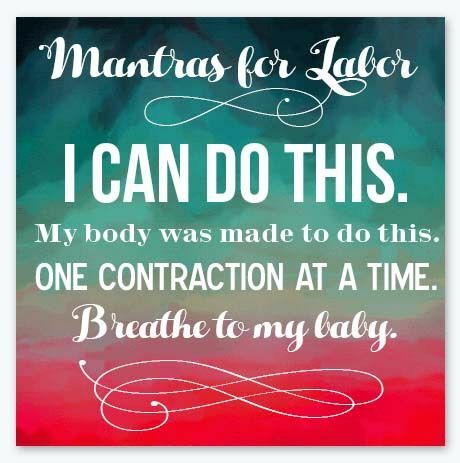 Get the girls together to create one or a series of canvas quotes to inspire the Mom to be to get through this exciting, but challenging time. Give the expectant mother in your life a unique baby shower surprise with some inspirational quotes printed to canvas. To find ideas, visit Google or Pinterest and search for 'labor quotes' or 'labour quotes'. There are so many amazing quotes available! To design your image, visit Canva and, if you love this square canvas print, choose a square image then add your background and text. In Canva you can choose any background and there's also a range of font styles and sizes. The best thing is that you don't have to be a graphic designer to use it. It's so easy! Once you're happy with your image, download them 'PDF: For Print', convert it to a .jpg then upload to the Canvas App. If you're after a Christening gift with a twist then here's a beautiful, bright treat from nature, ideal for a nursery. Christening presents can be so dull and boring, can't they? Bring color to a baby's room with a colorful gift, courtesy of Mother Nature. 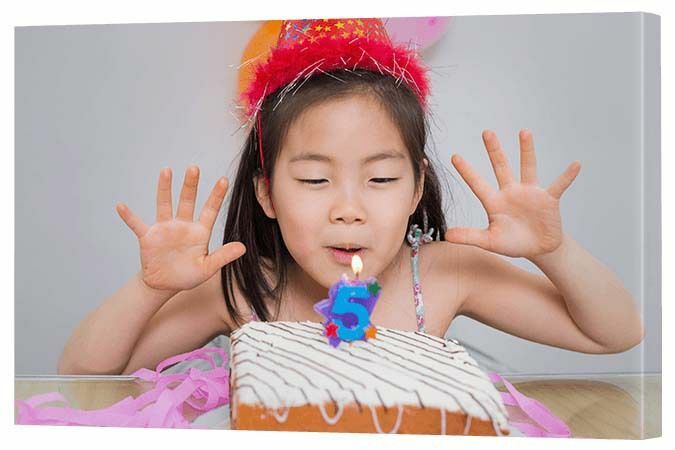 The wonderful thing about DIY canvas prints is that you can choose absolutely any image you like, upload it onto our Canvas App then print it in a multitude of different ways. 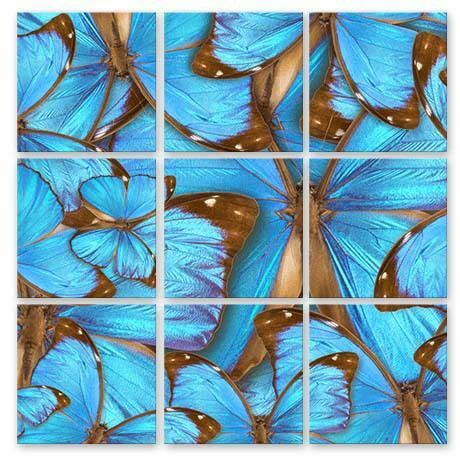 Here, to create a high art result, we've split a single spectacular blue butterfly photo across nine frames. The best thing about this photo gift idea is that the parents will appreciate walking into the nursery to discover something so bright and beautiful - and the baby will love growing up with something so miraculous in their room. Nature is amazing like that. Christmas is always about family, but often the gifts tell a different story. Here's a present that puts family first. Featuring a generous eight frames, this sensational wall display is fantastic for a fun, family canvas. Not only can you include numerous photos of the family having a wonderful time together, but you can customize your display with a quote of family traits or even 'rules'. Best last minute gift ever! Keen to gift a canvas, but have no idea what your friend, family member or colleague would like? Then gift them a blank canvas! What do we mean by blank? 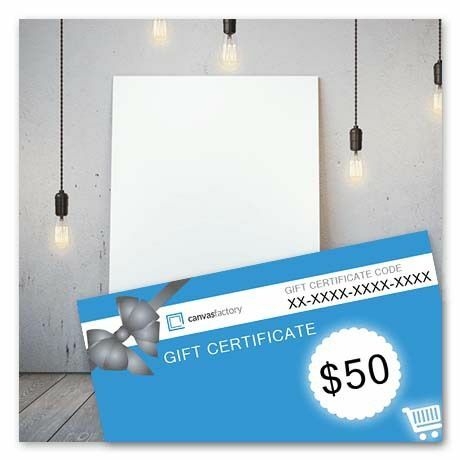 We mean presenting them with a gift voucher, so they can hop online and print whatever image they desire! 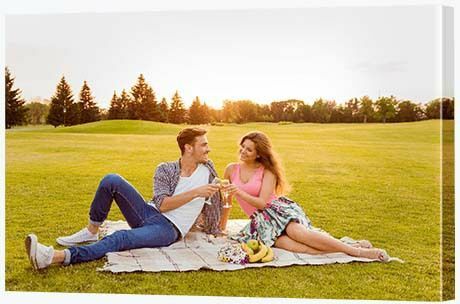 Not only can they print any image, they can choose to print multiple images on a collage or wall display and print on whatever material they prefer - canvas, glass or metal. Let them know they can print photos of anything they like - people, places, objects. They can also browse the Canvas Art gallery which features over 20 million high quality images - paintings, photography, abstracts. The digital gift is sent to you instantly via email, ready to forward on to the lucky recipient. Now THAT'S what we call last minute.